All you want is to maintain a healthy, green lawn throughout the warm seasons, but there is a host of destructive problems that your yard could encounter. One of these is a grub worm infestation, which can have severe adverse effects on the health of your lawn if not quickly identified and dealt with. 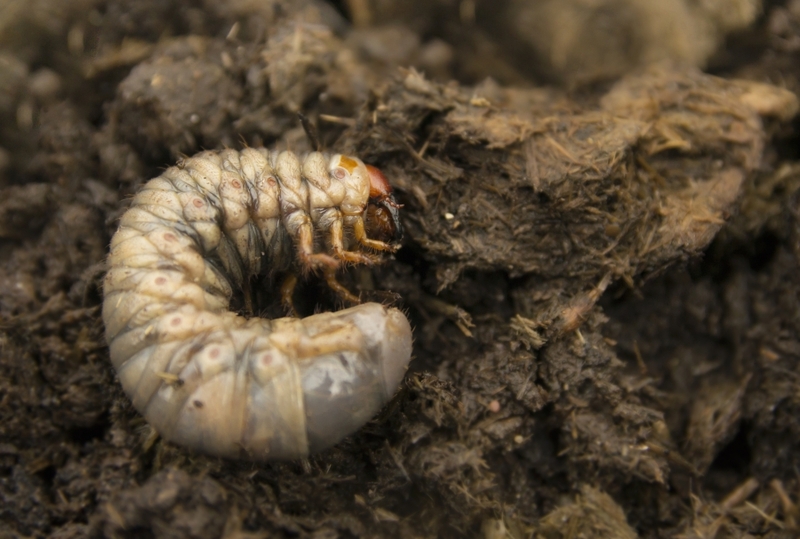 If you’ve never contended with grubs before, keep reading to learn what you need to know to be prepared for these damaging pests. Grub worms, also simply called grubs, are the larvae of certain species of beetles, which lay their eggs in healthy lawns and gardens during the summer season. The specific species of beetle depends greatly on where you live, and although not all adult beetles are hazardous to your lawn, all grub worms are typically considered to be pests in need of good riddance. What do grub worms do? Once the beetle eggs hatch, the larvae (grubs) burrow into the soil and use your lawn’s root system as a food source. As you can imagine, a sizable infestation can quickly ruin your lawn. By destroying the root system of your grass, depriving the soil of its nutrients, and acting as a food source for destructive bird predators, grubs can do a significant amount of damage. How can I identify an infestation? Grubs in small numbers won’t do too much damage, but they can become a big problem very quickly. It is generally considered time to do something about it once there are 10+ grubs present for every square foot of lawn. There are a number of ways to identify grub worm activity short of simply spotting them in your soil. Check for a grub infestation in your lawn by looking out for brown patches as the days turn warmer. If you lift the sod to find that it rolls easily from a lack of roots or if your grass peels away easily, you may have had a grub infestation issue the previous fall. During late summer, early fall, keep an eye out for dead patches, especially if you know that your lawn receives proper irrigation. If your lawn is watered on a regular basis with the correct amount of water and you’re still experiencing brown spots, the cause is most likely grubs. Sometimes, you can identify a grub infestation by the presence of other animals looking to use your lawn as a food source. Many different animals will tear your lawn apart in the midst of their grub hunts, including birds, raccoons, moles, and more. For example, a molehill can indicate grubs. When grub worms eat away the root base from your lawn, it can cause the ground to feel soft or spongy because there are no roots to add structural support. The grass may still appear green and healthy for a short time after your lawn begins to feel spongy, but dead patches will likely begin to appear. The best way to rid yourself of a grub infestation is to prevent it in the first place. Although there is no good way to stop beetles from laying their eggs in your lawn, staying vigilant can make the difference between a ruined yard and quick, effective treatment. When you opt into the lawn maintenance program we offer at Egypt Creek Landscaping, our lawn care experts will take care of your grub control needs. Learn the other benefits of our lawn maintenance program, and contact us for your lawn care needs today.